The connections are interesting. As a young man, Ashbery lived in France for a decade, and he has recently translated Rimbaud’s “Illuminations”. Ern Malley: back in 2002 John wrote a few poems in the “voice” of “Ern Malley”, whose writing inspired him as a young man at Harvard. Jacket number 17 publishes two of these poems, “Potsdam” and “Aenobarbus”, here. That issue of Jacket is a special “Hoax” issue, and has its own charms: Michael Leddy’s article “Lives and Art: John Ashbery and Henry Darger” (and Ern Malley), as well as a mountain of Ern Malley documentary material from the 1940s, a 70-page transcription of the Trial of Max Harris for publishing the original (and obscene) Ern Malley poems in 1943, Hans Magnus Enzensberger’s ‘Poetry Machine’, a three-page introduction to a poetry-writing computer he invented, given in English, and the original 20-page paper by Enzensberger explaining the theory and operation of the machine (in German): «Einladung zu einem Poesie-Automaten». Jacket 17 also features US poet Catherine Daly on Marjorie Allen Seiffert and the “Spectra” Hoax, a strange montage by German-born writer Schuldt titled “Homi Bhabha and the Forty Words” and the entire issue of «Free Grass» magazine, a hoax magazine I wrote one morning in 1968. Catch it all here: Jacket 17. If you are interested in Ashbery (and who isn’t?) Jacket 2 featured a special John Ashbery feature: John Ashbery poem: “The Burden of the Park”; Marjorie Perloff: Normalizing John Ashbery; John Tranter: Interview with John Ashbery, April 1985: “I’ve never really cared for «Self-Portrait» very much, and I must say I didn’t like it any more when I reread it. But I obviously had to put it in because people would expect it to be there.” And my later interview with John Ashbery in May 1988: “It seemed to me that my [first] book had fallen into a bottomless pit, and that I would never have another chance to publish another book of poems.” And my essay “Three John Ashberys: An Introduction”. So dash over to Jacket 2 and see what all the fuss is about. And on that Contents Page, a photo John Ashbery which I took in New York in April 1985; photo above. 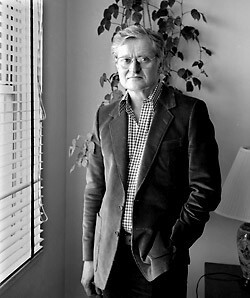 Note: John Ashbery will be a Kelly Writers House Fellow at UPenn in the [Northern] Spring of 2013. Kelly Writers House at the University of Pennsylvania: 3805 Locust Walk, Philadelphia, PA 19104 USA; tel: 215-746-POEM. email: wh@writing.upenn.edu and on the net.